Oh hell yes. 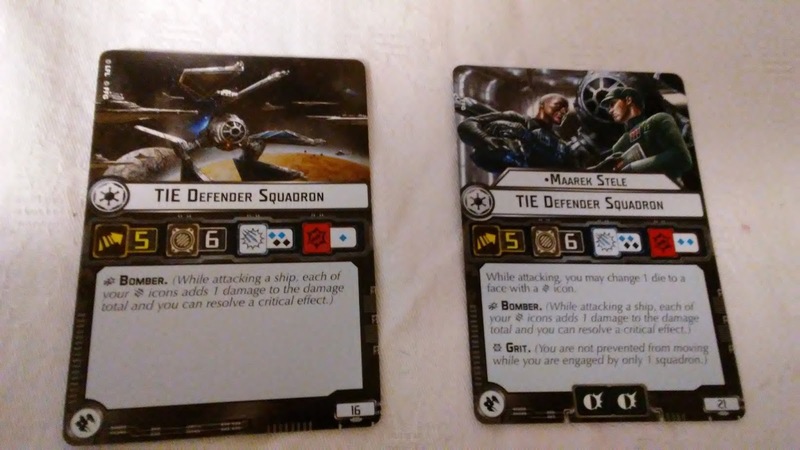 Today is a glorious day, because today is the day the best fighter squadron. The one I've been saving for last. The TIE Defender. I mean look at this beautiful fighter! For the cost of 2 generic TIEs, you get the elegance of Speed 5, Hull 6, 2 Blue / 2 Black Anti-Squadron, and 1 Blue Bomber Anti-Ship. Yes, technically less efficient than just purchasing 2 TIE Fighters, but what you lose in efficiency in pure numbers, you make up for in efficiency in activation! Imagine, an ISD1 activating 6 of these fighters to decimate the Rebel list? 6 Hull Y-Wings? Not a problem when you are doing 3 damage per activation (with Flight Controllers) and without any worry that the Y-Wings will be killing your squadrons in 3 shots. That is about 3 Y-Wings you are dropping right now. Or 3 X-Wings. Or maybe 4 A-Wings if you get lucky just once. You get the idea. And when you want to turn them against a ship, they are doing respectable damage, that you can make even more reliable with Bomber Command Center - perfect if you have brought some other Bombers along for the ride, and are just getting to use the Defenders for some extra damage. 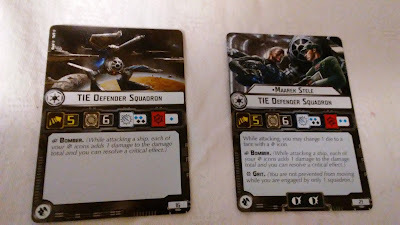 In X-Wing, poor Maarek never got any respect. But Col. Steele gets the respect he deserves in Armada. For one thing, his stat line is improved to 2 Blue Bomber dice, so on par with an 18 point Firespray. For the second thing, he picks up Grit, making him excellent at being in the right place at the right time. For the final thing, he gets to change 1 dice to a face with a Critical icon. That means if he is shooting a squadron, he is doing at least 1 damage (changing the black to a hit / crit), and after all there is a ~40% chance he misses with one of his black dice. But for shooting ships, he is guaranteed a Blue critical, even if he hits with both his shots. Now guess what that means if you've already stripped the shields with previous attacks? That is awesome. So, yes. Maarek Steel is awesome and is going in pretty much any Imperial list I make that doesn't rely purely on Rogues. For that matter, Defenders are going in pretty much any Imperial list I make. Oh, and that means I am done with Commander's Guides. And POD assignments are beginning for the World Cup. Gonna get some previews and maybe even some Matchups-of-the-Week going! Defenders look awesome. I am looking at using 6 with a lambda and an advanced for a Corelli an conflict list. Sounds like a perfectly viable squadron compliment. The best part of that is that they are difficult to kill, so they won't be scarred as easily as say a comparable amount of TIE Fighters. 'Tonight a Defender saved my life...' Just finished my World Cup game. If it weren't for the TIE/D'S ability to both dogfight and bomb I'd have been crushed instead of ekeing out a win. The speed 5 thing means they could move to exploit any gap in any shields just about anywhere. And if I'd remembered bloody Grit Maarek wouldn't have died and I'd have got a 7-4! Lessons learned. But gosh, I love the Defender!